NEED: Phase Three Atrium construction begins in 2018, and will be a 5,000 sq ft connector building between the first and second buildings. The atrium will include a reception, lobby, and open area for meals. DESCRIPTION: LARTC is being developed on three acres just 10 minutes from Panama City’s main airport. The complex will consist of two buildings connected by a large commons area. The first building is a 15,000 sq ft, two-story training and administrative center. The second building is a 15,000 sq ft, two-story housing facility. The 5,000 sq ft, atrium will connect the two buildings. BENEFITS: LARTC equips leaders and trains teachers through events and leadership dialogues that promote networking and coordination of educational efforts, as well as providing needed resources for ministerial training. The atrium will feature a mezzanine bridge that will connect the two existing buildings. By the end of 2018, LARTC will be functionally complete. Mid-March LARTC Construction Update...Giving thanks to God, our generous supporters, our construction crew and the LARTC staff for five months of hard work. Following is a list of what has been COMPLETED, just in time for the 2019 Educational Leaders Dialogue that begins tomorrow! 13 New Guestrooms Finished! This gives us a total of 23 versatile guestrooms (2 or 3 single beds or a king bed) and a total of 75 beds. Final electrical, plumbing and Internet… Split A/C units installed in all rooms, circulating hot water system functioning and wifi access points installed. Furnishings purchased… Freestanding closets, beds/mattresses, linens, nightstands/tables, desks and chairs, table lamps. In addition, sofas, chairs and kitchenettes for the two new suites with a refrigerator and microwave. Laundry and guest laundry completed… Washer/Dryer set for staff and Washer/Dryer stack set for guest laundry. Tables and chairs purchased... 100 additional chairs and 6 round tables. Atrium front and back wall work begun… 4x4 posts installed, foam/wire panels installed in back wall (to be stuccoed) for alternating solid and glass vertical sections. Road and front parking area reconditioned. 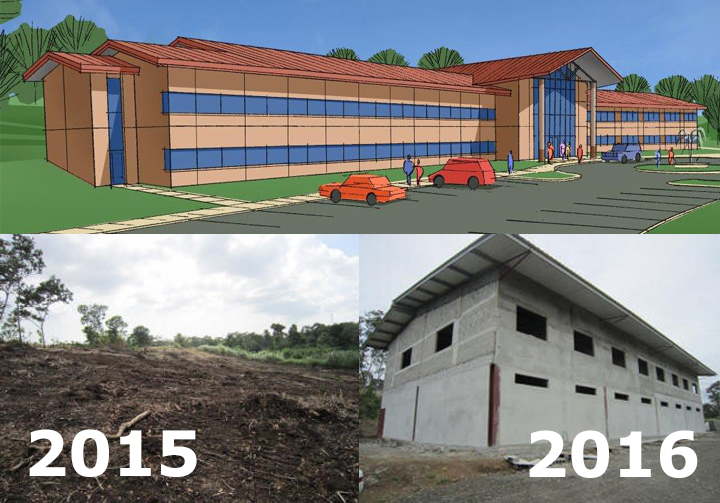 There has been a lot of progress made on the Latin America Resource and Training Center in Panama! Earlier in November, the block work for the second floor of housing was finished! Stucco work - inside and outside - is advancing well, second floor plumbing is being run above the first floor hallway drop ceiling, and even two large canvass paintings hung in the 10 1st floor guestrooms! Thank you to all who give and pray! Empower leaders - train teachers - provide resources. This is the three-fold ministry of Latin American Resource and Training Center (LARTC), located in the country of Panama. Led by AGWM missionaries, Rod and Sherry Boyd, LARTC serves educational ministries in 20 Spanish-speaking countries throughout Latin America. The LARTC complex will consist of two buildings connected by a large atrium area, for a total of 35,000 sq ft. It is projected to be functionally complete to equip leaders, train teachers, and produce resources by the end of 2018. Builders International is partnering with LARTC to complete the construction of this vital ministry site. Construction for the third phase addition launched in early 2018! This phase connects the training/administration wing with the housing wing. A team from Bakersfield, California, recently started work on the fourth phase addition. This phase will add space to the training center/administration building. The fifth phase will provide staff housing. Thanks for your prayers for this ministry as they raise up leaders throughout Latin America. These Christians will train an army of harvest workers destined to reach the world! Rod shares a mid-March update on LARTC construction. LARTC ATRIUM construction launched the first week of January! Once again, God miraculously provided a $50,000 offering that covers the structural expenses (foundation, columns, trusses and roofing). This third phase of construction connects the Training/Administration wing (left) with the Housing wing (right). The Atrium is a two-story enclosed building with full glass at the front and upper-story glass at the back. The initial artist’s drawing was modified to include the glass wall in the back and to move the stairs from each side to the center. The Atrium features a bridge mezzanine that connects the second floors of the Training/Administration building with the Housing building. When finished, the 5,000+ square foot Atrium will include a lobby and reception area, large auditorium for meetings and dining, restrooms, meal staging room and storage room. With the Atrium finished, the Latin America Resource & Training Center will be functionally complete! Phase Four will add space to the Training/ Administration building. Phase Five will provide staff housing. The Bakersfield First A/G (CA) MAPS Construction Team, together with a medical outreach team, will be arriving on March 2nd to begin block work on the back left wall (Phase Four addition), single-story back wall and the row of rooms behind the back wall (from left to right… storage, restrooms and meal staging room). These are highlighted in yellow on the image to the right. Our goal is to have the roof installed before the team arrives! And work is on schedule to meet this seven-week deadline! Stage 1 (Weeks 1-2): The back left Atrium column is shared with the back right Phase Four addition to the Training/ Administration building. Our architect and general contractor recommended that the entire Phase Four addition foundation be built. This work included building and pouring four large column footings and anti-seismic foundation beams to connect the four footings, and then to connect each footing with its matching Training/ Administration building footing. Four concrete pedestals were built to ground level, ready for the heavy I-beam columns when phase four construction continues. Stage 2 (Week 3-4): Four anti-seismic foundation beams were built, connecting the columns footings between the Training/Administration and Housing buildings. The backhoe operating demonstrated great skill in digging the foundation trenches between the two buildings without doing any damage to either of the existing buildings! Small footings and concrete pedestals were built for the eight columns that will support four trusses that span the distance between the Training/ Administration and Housing buildings. Our desire is to use an open truss design for the Atrium. Stage 3 (Week 5): Eight 6x6 inch I-beam columns have been erected on the eight footing pedestals. They will be cut to truss height. Once again, we were amazed to see the ingenuity of our general contractor to erect these columns without damaging the existing buildings. Stage 4 (Weeks 6-7): Trusses are being built and will be erected by the end of next week. Six-inch “C” channel purlins will be welded in place and large foam-core roofing panels will be installed. Please pray with us that all need work will be completed by March 2nd! We’ll keep you informed of Atrium construction progress, including work done by Bakersfield First. We post incremental reports to Rod's Facebook page at www.facebook.com/rodaboyd. Of course, these are only the first stages of the Atrium construction. We are trusting God to provide what is needed for electrical and plumbing, concrete floor and tile flooring, glass windows on the front and back walls, doors, construction of the bridge/mezzanine and stairs, lighting and other special features we have planned for the Atrium. We would be very grateful for your help! Offerings may be given by credit-card on the the A/G secure giving website. Or, mail your check to: Assemblies of God World Missions - Project 14295 LARTC, 1445 Boonville Ave, Springfield, MO 65802. In advance, thank you for standing with us as we raise up Christian leaders in Panama and beyond! JUST COMPLETED. The first floor of the Phase Two Housing Building is nearing completion! The 7,500 sq ft on the first floor include 10 spacious hotel style rooms, each with "privacy first" bathrooms (both the shower and toilet have their own door). Two of the 10 are suites that include a living room and separate bedroom. All 10 rooms are complete! STILL PENDING is the finish work on the commercial kitchen/pantry, laundry and storage rooms. WHAT'S NEXT. The stairwell on the back of the building a roof must be finished before September 30th. We look forward to having two teams this fall, one from the Grove Church (Marysville, WA) in October and Eastridge Christian Assembly (Issaquah, WA) in November. These teams will be laying block on the second floor of the Phase Two Housing Building that when finished will include an additional 12 guestrooms! PHASE THREE ATRIUM CONSTRUCTION BEGINS IN 2018. So far, we have two teams confirmed for 2018 that will be working on the Phase Three Atrium construction. The Atrium is the 5,000 sq ft connector building between the 1st and 2nd buildings. The Atrium will include reception, lobby and open area for meetings and meals. The Atrium will feature a mezzanine bridge that will connect the buildings 1 and 2 on the second floor. BY THE END OF 2018, LARTC WILL BE FUNCTIONALLY COMPLETE! With the Phase Three Atrium complete, the LARTC will be able to fulfill its missions to equip leaders, train teachers and produce resources. There are two future phases planned that will increase the training and administration areas and provide staff housing. Thank you for your prayers and giving (//s1.ag.org/lartc)! Join Rod as he walks through the construction progress on the Phase 2 building. The 10 guestrooms need to be finished by July 31st! A mixed team of 12 men, women and youth from Portland (OR) Christian Center (PCC) returned the end of March, giving two weeks to block the first floor of the Phase 2 housing building. In addition to a commercial kitchen, pantry, laundry and storage area, the Phase 2 building includes 10 guestrooms, each with its own bathroom (See the floor plan below). The second floor of the Phase 2 building will provide an additional 14 guestrooms. This small PCC crew was extra special. We often talk about an anointing over preachers and others in ministry. But if there ever was an anointing over a building team, this group had it! 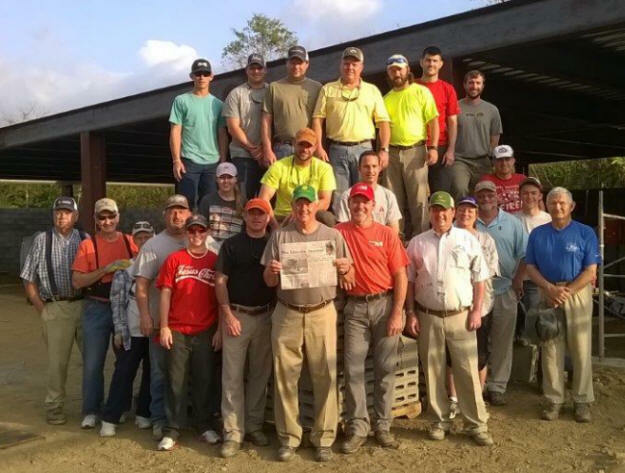 The Panamanian crew worked alongside the PCC team, mixing mortar, cutting rebar and forming and pouring bond beams. This allowed the PCC team to focus on laying block. The team was able to complete more than three-quarters of the block work on the 10 guestrooms. During their 10 days of work they were able to lay over 5,000 block. 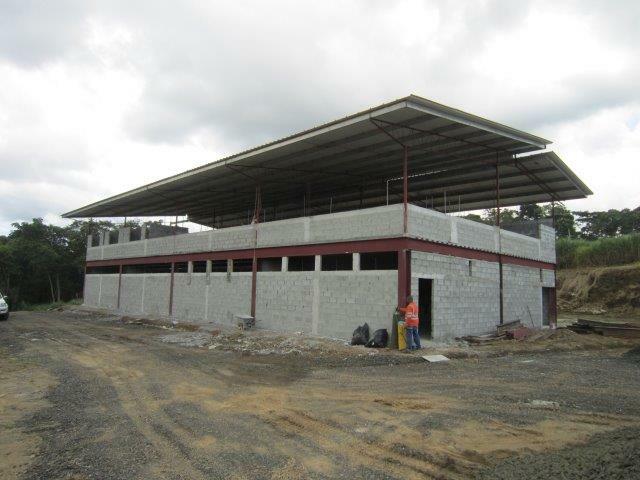 The Panamanian team has continued working on the building in the last several weeks. They are just now finishing the final block work ahead of another team that will be arriving on June 15th to work on the electrical wiring. Both the PCC and Panamanian workers gathered together each morning for a time of devotions and prayer. Daniel, one of the teens on the PCC team, translated from both English to Spanish and Spanish to English. This devotional time helped to bond the two teams together and we believe the Lord honored our prayers for protection and strength! The PCC team worked a full two weeks, but took the weekend between off to rest and tour. 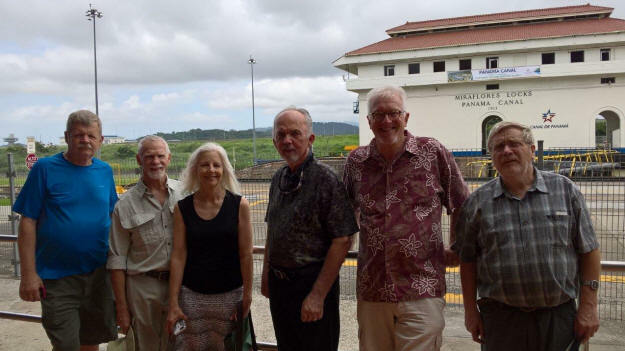 Saturday morning, we crossed the isthmus of Panama to visit the Gatun Locks and Visitor Center for the Panama Canal. The new visitor is elevated and provides a breathtaking view of the bay and entrance to the Canal. We had the team over to our apartment at the end of the tour day. On Sunday we visited three different churches that have schools. Our first stop was to visit the Jehovah Jireh Church. After a beautiful time of bi-lingual worship and a greeting from the church, we toured the school facilities. Three different PCC teams participated in the construction of both a two-story building (2000) and a four-story building (2007 and 2008). There are 651 children and youth, kindergarten through 12th grade, attending this school! Our last church to visit was the Good Shepherd Family Church. Pastor Julio welcomed us into service. After service concluded members of the church visited with team members that were a part of the school and church construction in 2000 and 2001. More than 800 children and youth, kindergarten through 9th grade, attend the Canaan Good Shepherd School. Thank you, Dave (team leader), Jim, Sherry, Terry, Vi, Steve, Arlen, Nate, Joyce, Emma, Daniel and Joel, for your hard work. You have been our anchor in this project and we couldn't do it without you! God will use your investment in the Latin America Resource & Training Center and multiply it to equip dozens of international and national leaders and thousands of teachers and directors who are reaching and training thousands more! PCC, we hope to see you back next year! 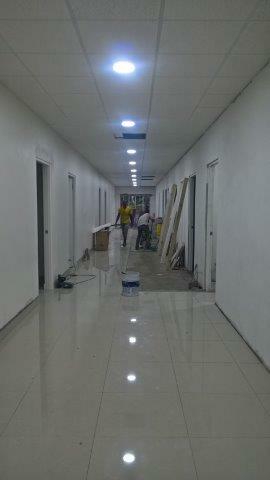 If so, the rooms that you building will be ready for you! For now and for the coming weeks, please join us in praying that the first floor will be finished by the end of July. We have 35 pastors and leaders from Panama and surrounding countries that will be taking advanced studies for the whole month of August! 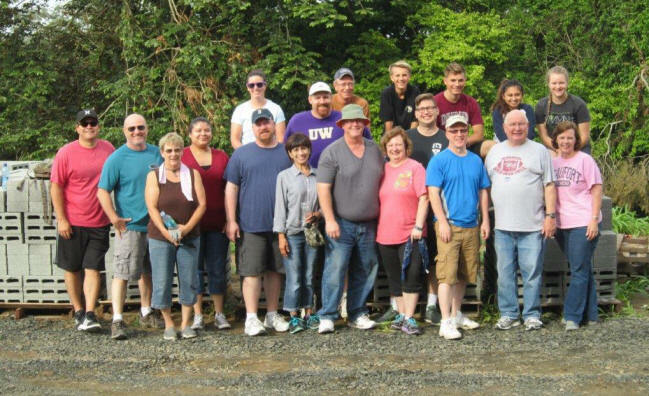 We're so grateful for the work of a small team from our home church, Calvary Christian Assembly, Seattle, WA who spent 9 days with us in June. 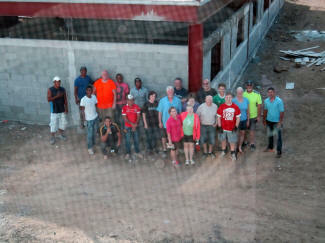 Pastor Steve Pecota led this group of six in their work to "wire" the first floor of the new Phase 2 Housing Building. Good friend Bill Donnelly was a part of the group. He came three days early and stayed an additional day to help gather materials and coordinate the preparation work ahead of the team. The team worked quickly to pull both electrical and data/telephone wire in the pvc pipe that had been run in the walls and floor during construction. They ran into two or three pipes that were blocked or damaged and had to either break the pipe if it was in an area where there was access or in one case, had to run a new pipe above the area of the suspended ceiling. Our priority was for them to run wire for the 10 guestrooms for outlets, lights, data and telephone. We were also hoping to have the conduit run for the rest of the building while the team was there--an area representing about 25% of the floor space that includes the commercial kitchen, pantry, laundry, staff bathroom and storage room. Because we weren't able to finish the conduit, instead we shifted half of the team to work on the suspended ceiling aluminum framework. This team was able to finish six of the 10 guestrooms. A whole day was taken in running the main line conduit from the building one electrical room to the building two electrical closet. Four thick cables were then bundled together and attached to the "pull rope" that had been run in the main pipe as it was put together. It took the whole team to push and feed while a Panamanian crew pulled, with the help of a pick-up truck! Electricity is now "hot" in the housing building. In the next few days the wires will be connected to the panel and circuit breakers installed. The remaining rooms in the building will be "wired." Let there be light! During work days, Sherry prepared a lunch for the team in the LARTC "production" kitchen, located in the building one production area. The last day the team invited nine from the Panamanian crew to join them for lunch. Jose Quintana, friend and generally contractor, joined us in recognizing each team member with a tagua (palm ivory) figurine and some Panamanian coffee. The CCA team commented about how much they enjoyed working alongside our Panamanian brothers. We visited two different churches on Sunday, then lunch and a drive through Panama City. During the week, we attended the two chapel services at the Getsemani Good Shepherd School. The school has grown so much that they fill the sanctuary two times with the chapels. Pastor Steve shared an inspiration devotional about how God wants to use Panama and each of its citizens to bless the world. After the hard workd, the team visited the Panama Canal Visitor Center and the French Quarters in Old Panama, with a late lunch at our place, enjoying some spectacular views from the roof top of our apartment building. For such a small team, this CCA Strike Force accomplished an amazing amount of work. Because of our time crunch, we can't imagine getting the 10 guestrooms ready for occupancy by July 31st without the CCA team. Thank you, Pastor Steve, Bill, Ron, Andy, Bob and Krystal for all your hard work. Thank you for helping us empower leaders, train teachers and develop and produce resources for current and future harvest workers! These words were written the first days of October 2016: "For the last few months we’ve shared that we need an additional $75,000 to 100,000 to complete Phase One of the building. We are happy to announce that we’ve been presented with a MIRACLE OPPORTUNITY... A Christian foundation is offering a $50,000 matching donation! We have until the end of the year to raise $50,000 to secure this gift. So far, we’ve received $8,000 in special donations towards this goal." By the November 1st, $30,000 had been given and the remaining $12,000 pledged. We exceeded the match goal by $10,000! By December 1st, the Christian Education Foundation issued a SECOND $50,000 match! 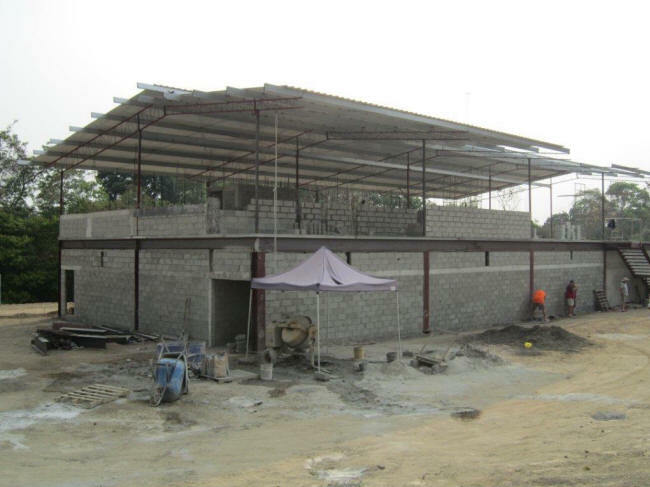 July 2-10... A mixed team of 19 men, women and youth advanced construction of the Latin America Resource and Training Center, laying perimeter block on the second floor and installing the suspended ceiling aluminum framing in the large classroom on the first floor. The team had few experienced builders, but with the help of our Panamanian brothers, they caught on quickly to the tricks of laying block. In the end, they laid about 40% of the second-floor perimeter wall up to bond-beam height. A few days before the team arrived, the roof was seriously damaged by a severe tropical storm. Thirteen roofing panels were blown off the roof; some pieces carried more than a 100 yards over the tree line. Members of the team and church gave funds to purchase and install replacement panels. Our ongoing emphasis continues to be construction of the Latin America Resource & Training Center (www.lartc.net). Last month we shared the big picture of what has been accomplished in just one year. This brief report is the construction blitz that has taken place over a three-week period, from January 14th to February 4th, 2017! We hope you'll take time to view the two videos prepared, one at the beginning, the other at the end. All of the photos and video we have are in those two reports. Second floor is priority to prepare for the office move... All floor tile has been finished on the second floor and on the stairs. Power is on in the building. Lights have been installed. The first coat of the finish paint has been applied. Door jams are being installed and doors will be hung in the next few days. The window manufacturer delayed delivery of the windows, but they should arrive on Wednesday. Air conditioning equipment has been delivered and is in process of being installed. We are still believing for a February 20 office move to the new facilities. First floor tile base is prepared and tile will be laid in the next two weeks. Suspended ceiling is 40% complete and will continue. Exterior security doors have been installed. Phase Two Building is Launched. We purchased materials and authorized work to begin on the Phase Two Building on January 14th. In one week's time 15 column footings were excavated and half of them poured. By January 28th all were poured and most back-filled. Taking advantage of the heavy equipment, we cleared some land at the edge of the property by the back hill and with the excavated dirt that remained extended the front side of the property 25-30 feet. By Feb. 4th, all column footings were back-filled with the pedestal iron plate welded in place to place the 15 I-beam columns. Anti-seismic foundation beams are 50% complete. In addition, the area behind the Phase One building was re-leveled and graveled for temporary parking. The 15 columns will soon be erected and welded into place. We will be purchasing the heavy I-beam material used to manufacture the four long crossbeams. Additional support beams will welded in place, metal deck laid, rebar grid laid out and the concrete floor will be formed and poured by the middle of March. The Portland Christian Center MAPS Construction Team will be arriving the last week of March to begin block work on the first floor of the new building that will include a kitchen, 10 guestrooms, laundry and a large storage room that will be used as a temporary dining hall. The first floor must be finished and ready by the end of July to house 40-50 pastors and leaders who will spend the month of August in four weeks of advanced training. Thank you for standing with us as we raise up Christian leaders throughout Latin America, who in turn are raising up an army of harvest workers destined for the four corners of our world! For those that have followed our missionary ministry, you know that there are times when it's been necessary to "step out in faith." Once again, we find ourselves stepping out in faith, far beyond our comfort zone, convinced that we are following the Spirit's direction and with full confidence that our God will meet us there. The great battles, the battles that matter for eternity, are fought in the "unseen" areas of our lives. As we contend for the construction and development of the Latin America Resource and Training Center, we know that battles fought and won in the "unseen" areas will impact the long-term effectiveness of the ministry to equip leadership, train teachers and develop resources that are destined to shape the next generation of harvest workers. We also know that we are not alone. God is already there. But also, He has so many of you having joined us, together stepping out in faith. Thank you! 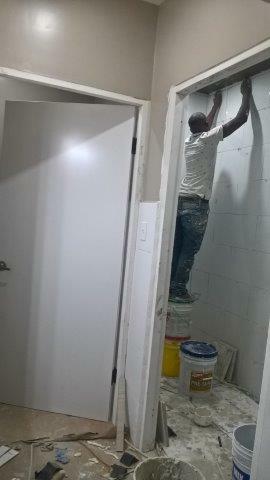 -The final bathroom walls that contain plumbing are up! -All stucco work will be completed before December 15th. -Almost one half of the electrical wire as been pulled. -Materials for the septic tank and system have been purchased and work has begun. -All drop ceiling materials have been purchased and work will be completed by the end of December. -All floor tile has been purchased. Sand and special "topping" cement will be purchased and tile work will begin soon. -We will be purchased doors and windows before the end of December. -Base paint has been purchased. Please pray with us for the remaining material purchases and labor costs. Please visit www.lartc.net for continued updates with photos. 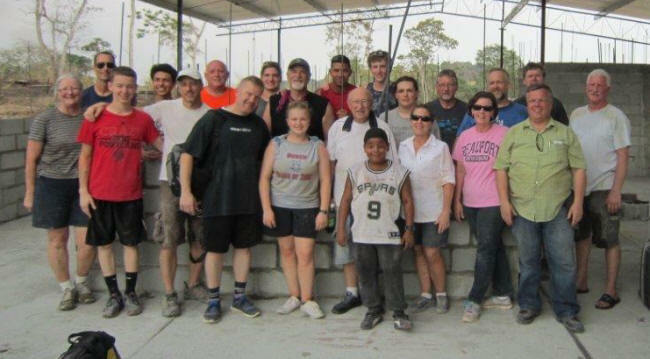 We're grateful for the work of the mixed team of 20 men, women and youth from Portland (OR) Christian Center who spent two weeks in late March and early April 2016 advancing construction of the Latin America Resource and Training Center (www.lartc.net) in Pedregal, Panama, near the Panama City Airport. Their principal work was to block above the bond beams on the first floor, plumb and block two first-floor multi-stall bathrooms and begin block work on the second-floor administrative area. A group of 24 men, women and teens from Lincolnton GA First Assembly of God blocked the nearly 4,500 square foot first floor of the training and administration building. This is the first phase of construction. A time-lapse video of their work can be seen on Vimeo at https://vimeo.com/156087499. We look forward to our next team from Portland Christian Center (OR) who will be laying block on the second floor. Foundation, footings, block walls, bond beams, etc. Safety glasses, gloves, boots, etc. Trowel, pliers, hammer, level, string line, measuring tape, etc. Skill saw with diamond blade, drill, impact drill, grinder, etc.